Post : Professor – 3 posts, Associate Professor – 6 posts, Assistant Professor - 13 posts. 2. Please mention Post Applied and Department on the left-top corner of the envelope containing the application. 4. Last date of application is 16th Nov, 2012 for all disciplines. 5. The application form should be accompanied by Demand Draft of Rs. 300/- for General Category and Rs. 150/- for SC/ST/OBC in favour of “Director, NIT Manipur” payable at SBI, Secretariat Branch, Imphal. 6. Application received after the last date and/or even on the date of Interview may be considered if decided by the NIT Manipur Authority. OR Graduate + Post Graduate Diploma in Materials Management [or any other subject relating to Purchase & Stores activity] with 3 years experience [1 year in supervisory capacity] in the relevant field. OR Post Graduate with 3 years experience [1 year in supervisory capacity] in the relevant field. OR Graduate with 5 years experience [2 years in supervisory capacity] in the relevant field. The application for on-line registration will be hosted in the ISRO web-site at www.isro.gov.in during the period from 16-10-2012 to 05-11-2012 and candidates may register their applications on-line during the period. Applications will be received on-line only. Payment of Application Fee : There will be an Application Fee of Rs.100/- (Rupees One Hundred Only). After registration of application on-line, candidates have to down-load and print the personalized payment challan form, in three parts, from the ISRO web-site. By using the personalized payment challan, candidates have to remit the application fee at the nearest branch of State Bank of India to Receipt Account No. 32034064593 on any day between 16-10-2012 and 06-11-2012 After remittance of the application fee, candidate has to send one part of the challan form [ISRO copy] to Sr. Administrative Officer (ICRB), ISRO Headquarters, Antariksh Bhavan, New BEL Road, Bangalore -560 094 by post within 7 days and in any case not later than 13-11-2012. The payment shall be made through cash deposit only. Payment of Application Fee in any other form like Cheque, Draft, Money Order, IPO, etc. are not allowed. Applications in respect of which copy of challan form, after remittance of prescribed application fee [ISRO copy] is not received in ISRO HQ, Bangalore on or before 13-11-2012 will not be considered for further processing under any circumstances. Women; Scheduled Castes (SC); Scheduled Tribes (ST); Ex-serviceman [EX] and Persons with Disabilities (PWD) candidates are exempted from payment of Application Fee. However, after registration of application on-line, candidates have to down-load and print the personalized registration confirmation form, in two parts, from the ISRO web-site. The candidates have to send one part of the registration confirmation form [ISRO copy] alongwith a certificate indicated against each category, as below, to Sr. Administrative Officer (ICRB), ISRO Headquarters, Antariksh Bhavan, New BEL Road, Bangalore -560 094 by post within 7 days and in any case not later than 13-11-2012. The Gross Emoluments in the minimum of pay band will at present be approximately Rs.34,650/- p.m. In addition, HRA and Transport Allowance at the prescribed rates in force at the place of posting will be paid for those who are not availing Departmental Housing and Transport facility. The employees will be governed by New Pension Scheme. ISRO provides attractive benefits to its employees such as medical facilities for self and dependants, subsidized canteen, free transport [or in lieu transport allowance], limited housing facility for fresh entrants [or in lieu HRA], Leave Travel Concession, Group Insurance, advances for purchase of conveyance, construction of house etc. Based on bio-data, initial screening will be conducted to short-list candidates for taking-up written test. The written test will be conducted at seven venues viz., Ahmedabad, Bangalore, Sriharikota, Delhi, Hyderabad, Kolkata and Thiruvananthapuram. Candidates short-listed based on the performance in the written test will be called for interview, the schedule and venue of which will be intimated. Candidates attending the interview will be reimbursed to and fro second-class train fare by the shortest route from the address given in the application to the place of interview. Qualification : Graduate from Any Recognized University and also must have passed English Shorthand Examination from any recognized board of Shorthand & Typewriting at the speed of 80 Word Per Minute. He/She must be of good character. How to apply: Interested eligible candidates may apply on the prescribed Application Form to the Principal, Sainik School, Chittorgarh (Rajasthan) 312001 along with a Demand Draft for Rs.200/- (non-refundable) drawn in favour of Principal, Sainik School, Chittorgarh, payable at State Bank of Bikaner & Jaipur, Chittorgarh and a self addressed envelope. The application form is available in the school office and can also be down loaded from under mentioned school website. Last date of receipt of application in the school is 21 days from the date of publication of the advertisement. No application will be received after 1700 hrs on the last day. School will not be responsible for any postal delay. The post and trade applied for should also be mentioned at the top of the envelop eg. General Employee Regular _____ (trade) or General Employee Contractual ________ (Trade). Only short listed candidates will be called for interview. No TA/DA will be admissible for attending interview. The School administration reserves the right to cancel the interview due to any administrative reasons. NOTE: If any candidate wants to apply for more than one trade/post, he can do so, but, he has to apply separately for each post. Essential: Masters’ degree in any discipline with at least 55% marks or its equivalent grade ‘B’ in the UGC 7 point scale from a recognized University/Institute. (ii) Experience in handling computerized administration /legal /financial /establishment matters. Method of Recruitment : Direct recruitment, failing which on deputation or contract basis for tenure of up to 5 years or till attaining the age of 62 years whichever is earlier, or as fixed by Govt. of India by orders issued in this regard from time to time. Masters’ degree in any discipline with at least 55% marks or its equivalent grade ‘B’ in the UGC 7 point scale from a recognized University/Institute. Essential: (i) B.E./B. Tech. Degree in Mechanical Engineering with first class or equivalent grade (6.5 in 10 point scale or 60% marks) and consistently excellent academic record. Essential: (i) MBBS Degree or equivalent qualification included in any one of the Schedules to the Indian medical Council Act, 1956 (102 of 1956) and must be registered in a State Medical Register or Indian Medical Register. Experience: For MBBS degree holders, experience of 5 years as Medical Officer in a hospital or dispensary. Age Limit: Candidate should have 45 years for Dy.Manager (HR)/ Manager (HR) Post, 48 years for Joint Company Secretary Post and 50 years for Additional General Manager (Finance)-(Taxation) (Merchant Banking), Additional General Manager (Flight Operations & Safety) Posts, 52 years for General Manager (Marketing & Projects&Contracts) Posts as on 01-10-2012. Educational Qualification: Candidate must possess Degree in Engineering/ Degree with MBA/ CA/ ICWA/ Degree in relevant disciplines. Application Fee: Application Fee Rs.425/- (Application fee of Rs. 400 + Bank commission of Rs.25) (SC/ ST/ PWD candidates are exempted). Application fee is to be deposited in the “Hindustan Aeronautics Limited – Recruitment Account” bearing number 30969511830 at any of the core banking branches of State Bank of India in the prescribed Challan. Selection Process: Selection will be done on the basis of performance in interview. How to Apply: Eligible candidates may submit their applications in A-4 size paper strictly in the prescribed format available in the notification along with a self-attested recent Passport Size Photograph and challan of HAL copy with super scribing on the envelope the title of the post applied for must be sent to the Chief Manager (HR), Hindustan Aeronautics Limited, Corporate Office, 15/1, Cubbon Road, Bangalore-560 001 on or before 17-11-2012.
years for all remaining posts. Educational Qualification: Candidate must passed Class V / Class IX / 10+2. Application Fee Details: Application forms will be available at all offices of all District Superintendents of Police and Commandants of MLP Battalions and Principal, PTS Mawroh Shillong on payment of Rs. 50/- (Rupees Fifty Only). Selection Procedure: Candidates will be selected on the basis of Physical Efficiency Tests, Written Examination, Interview and Medical Test. How to Apply: Eligible candidates may apply through prescribed application format on or before 15-11-2012. For posts at Sr.Nos.1 to 6: Rs.9300-34800 with Grade Pay of Rs.4200/( Total emoluments on the minium of the pay band is Rs.28970/per month including HRA). B.E./B.Tech. in Computer Science and Engg./Electrical Engg./Electronics Engg./Telecommunications Engg./ Instrumentation Engg./Information Technology or equivalent degree; or M.C.A. with two years experience. B.E./B.Tech. in Metallurgical Engg./Mechanical Engg. or M.Sc. in Physics. M.Sc. in Physical Chemistry; or B.Sc. in Chemistry with two years' of relevant experience; and knowledge of computer applications. I.C. Engines Lab. : B.E./B.Tech. (Mechanical). Good communication skills for assisting laboratory classes and tutorials. B.E./B.Tech. in Electrical Engg./Mechanical Engg./ Metallurgical Engg./Chemical Engg. with one year experience in operating TEM/SEM OR M.Sc. in Physics/Chemistry/Biological Sciences with one year experience in operating TEM/SEM. Bachelor's degree. Must have active habits, sound physique and 4 years experience in watch & ward duties. ExServiceman of supervisory cadre with armed license would be preferred. Age limit : 32 years (relaxation as per rules) for posts at Sr.Nos.1 to 6. 30 years (including relaxation for OBC candidates) for post at Sr.No.7. Applications with full particulars quoting advertisement No.H43/1213 together with a Demand Draft of Rs.50/( No application fee for SC/ST/PH & Woman candidates) drawn in favour of Registrar, IIT Bombay payable on SBI, Powai, Mumbai and copies of certificates/testimonials, caste (in case of OBC, latest noncreamy layer certificate is essential) etc. should reach the Registrar, IIT Bombay, Powai, Mumbai400 076 on or before 23 rd November, 2012. Candidates are requested to write name and the post applied for on the reverse of Demand Draft. TERMS & CONDITIONS:1. All the posts carry usual allowances as admissible to Central Government Employees of similar status at Delhi/New Delhi. 2. Upper Age Limit: 50 (Fifty) years. However, relaxable for Government Servants, Scheduled Castes, Scheduled Tribes or otherwise exceptionally qualified applicants up-to 5 years and 3 years in the case of Other Backward Classes candidates. Upper age limit will be taken as on closing date of submission of application. 3. Application fee: Rs. 500/- (Rs. 100/- for SC/ST candidates) through SBI Bank Challan/ Debit Card/Credit Card. The application fee once remitted shall not be refunded. 4. Last date for on line submission of application: 23.11.2012 by 5.00 P.M.
5. The effective date up-to which the requisite experience must be completed will be 30.06.2013. 6. The candidate can submit applications online through internet only. Applications submitted/sent through postal services or otherwise shall not be entertained / accepted. The candidates must read the instructions, help manual and other details carefully before applying and follow the instructions given. Last date for on line submission of application: 15.11.2012 by 5.00 P.M. Application fee: Rs. 500/- (Rs. 100/- for SC/ST candidates) through SBI Bank Challan/ Debit Card/Credit Card. The application fee once remitted shall not be refunded. The candidate can submit applications online through internet only. Applications submitted/sent through postal services or otherwise shall not be entertained / accepted. The candidates must read the instructions, help manual and other details carefully before applying and follow the instructions given. unreserved/OBC and 50% for SC/ST/HC category candidate. A suitably devised written test at Jabalpur shall be organized for the post of 1,2 3, & 5. For the post at Sl. No. 5 a skill test shall also be organized at Jabalpur. The selection process for these posts shall be intimated to the eligible candidates in due course and the same shall be uploaded in MPPTCL website also. As far as selection for the post of Junior Engineer (Sl.No.-4) is concerned, it is indicated here that the preliminary merit list shall be prepared based on the marks obtained by the candidates in qualifying examination as advertised for the post. The short listed candidates shall undergo personal interview at Jabalpur. 1. The prescribed application format may be downloaded as indicated hereunder. The completed application with copies of the required certificates of qualifications/cast/experience/MP domicile/handicapped certificate etc. shall be submitted to Post Bag No-05, New Delhi - 110003 through ordinary post on or before 09.11.2012. Candidates belonging to Unreserved/OBC category shall be required to enclose Demand Draft of Rs. 1000/- towards application fees & incidental charges, while the MP domicile candidates belonging to SC/ST & handicapped category, shall be required to submit a Demand Draft of Rs. 250/- only towards incidental charges. The demand draft should be drawn in favour of Regional Accounts Officer, MP Power Transmission Co. Ltd. Jabalpur. Applications received after due date shall not be accepted and no correspondence shall be entertained in this regard. MPPTCL shall not be responsible for any postal delay. Essential Qualification : M.Sc. / M.Sc(Ag.) in Horticulture/ Floriculture or M.Sc. in Botany from a recognized university. Desirable Qualification : (i) Research experience on flower crops, data compilation with good command over computers. (ii) Experience in morphological characterization of flower crops, sound knowledge in Plant Breeder’s Rights and DUS testing of Flower crops. Essential Qualification : Graduate with good command over computers. Desirable Qualification : working experience of computer in recognized / reputed organization. & women and three years for OBC). The interview of eligible candidates will be held on 3rd November, 2012 at 10.00 A.M. in the chamber of The Head, Division of Floriculture and Landscaping, IARI, New Delhi-110012. Educational Qualification: Candidate must possess B.E/ B.Tech in relevant disciplines. Selection: Selection can be done on the basis of performance in interview. How to Apply: Eligible candidate may apply through online at www.ircc.iitb.ac.in , or may apply on plain paper stating the CIRCULAR NO. , project title, position applied for, name, permanent and mailing addresses, date of birth, details of academic qualification and experience or may also apply through by downloading the prescribed application form, fill that application completely and send along with copies of certificates and must be super scribe the envelope with CIRCULAR NO. & POST to the Senior Administrative Officer(R & D), Indian Institute of Technology, Bombay, Powai, Mumbai-400076 so as to reach on or before 06-11-2012. 2. Login with given user name and password, if not register by clicking on New Applicant Register Here button. 3. Then complete with the given details. 4. And click on submit button. Last Date for Receipt of Application: 06-11-2012. Written test/Interview for selection of 'Spices Extension Trainees' for various Offices Under Development Department of the Board. Education Qualification : B.Sc (Agriculture/Horticulture) or B.Sc (Botany/Zoology/Microbiology/Biotechnology) with certificate in Computer Course. 1. Those who have completed their course of study during the academic years 2007-08,2008-09, 2009-10, 2010-11 and 2011-12. 2. Those who had engaged as Out sourced Technical Assistant (OTA) in extension activity at spices Board on contract basis are NOT eligible for applying to this programme. Pay Scale : Rs 12000/- Per month and in case of travel to spice field , TA will be paid as per rules. 1. Desirable qualification: Candidate should possess PGDCA from the recognized institute. 2. The appointments will be exclusively on contractual basis for the specified period March 2013 only, which can be terminated by one month notice from both the sides or termination of the project or any other reason any time. 3. Maximum age limit for male candidates is 35 years and for female candidates is 40 years as on date of interview. 4. Candidate should produce DD of Rs. 100/- in favour of the Dean, College of Agriculture, JNKVV, Jabalpur at the time of interview (SC/ST candidates are exempted as per rules). 6. No TA & DA will be paid for attending the interview. 7. English language and knowledge of computer is desirable. 8. Dean’s decision will be final and binding in all respect. 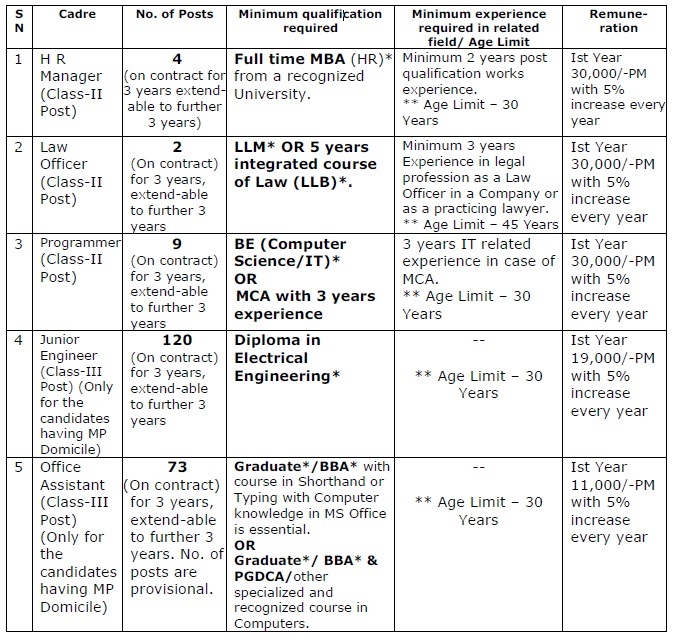 Age Limit: Candidate should have below 30 years for Project Fellow Post, below 35 years for Technician Post and below 40 years for Scientist-2 Post. Educational Qualification: Candidate must possess B.Tech/ MCA/ M.Tech/ Doctorate in Instrumentation/ Diploma in relevant disciplines. Selection: Selection can be done on the basis of performance in test/ interview. How to Apply: Eligible candidates may apply through prescribed application form given in the notification, fill it completely, affix passport size photograph on it and send to the IIT-A, Deoghat, Jhalwa, Allahabad-211012 (U.P), India on 02-11-2012. Age Limit: Candidate should have not above 70 years as on 01-10-2012. Educational Qualification: Candidate must possess Degree in Law from recognized university and copyright law should be one of the subject. How to Apply: Eligible candidates may apply through prescribed application form given in the notification, fill it completely, affix passport size photograph on it and along with two recent passport size photographs and certified copy of certificates in support of their educational qualification and experience etc should be super scribing on the envelope “Application for the Consultant for Copyright Law” must be sent to the Project Manager (PRU), EdCIL (India) Limited, EdCIL House, 18 A, Sector-16A, NOIDA (UP) -201 301 on or before 31-10-2012. Educational Qualification: Candidate must possess Graduate/ CA/ ICWA/ CS/ MBA/ PG in relevant disciplines. Offline Mode: Candidates may apply through E-mail to hhecjobs@hhecworld.in by sending completed form or also apply with prescribed application form given in the notification, download the prescribed form and fill it completely, affix passport size photograph on it send it to the Handicrafts & Handloom Exports Corporation of India Limited, A-2, Sector-2, Udyog Marg, Noida (U.P).-201301 within 15 days from the date of publication of the advertisement i.e 17-10-2012. Online Mode: Candidates also apply online in the prescribed format by clicking the http://www.hheconline.in/resume/resume.php link, fill it with given information and upload completed prescribed form and click on submit button. The applications should be submit within 15 days from the date of publication of the advertisement i.e 17-10-2012. Last Date for Receipt of Application: within 15 days from the date of publication i.e 17-10-2012. 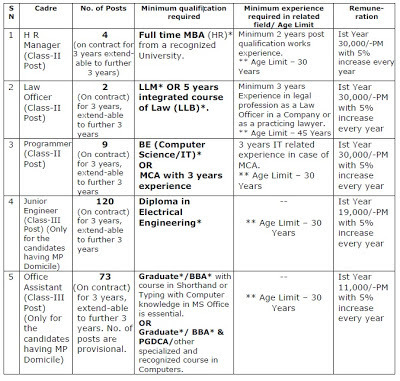 Age Limit: Candidate should have 28 years for Project Assistant Level-II, SRF Posts, 32 years for Project Assistant Level-III Post and 25 years for Project Assistant Level-I Post, 35 years for Project Assistant Level Post. Educational Qualification: Candidate must possess B.SC/ M.Sc in relevant disciplines. How to Apply: Eligible candidates may apply with prescribed application form, fill it completely and affix photograph on it along with attested copies of all the relevant Certificates, original certificates with themselves on the date of interview to the Indian Institute of Toxicology Research, M.G.Marg, P.O.Box No.80, Lucknow on 30-10-2012 & 31-10-2012.